Indiana Gov. 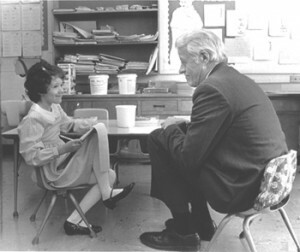 Robert Orr speaks to a first grader in 1985. Orr would pass his signature legislative package, "The Indiana A+ Plan," two years later. Click on the image to view the story where the image appears. In the not-so-distant past, Indiana lawmakers passed a sweeping education overhaul — but not the overhaul you’re probably thinking about. The law, however, wasn’t passed in 2011 — like the charter and voucher legislation we often refer to as “Indiana’s recent education overhaul.” The governor wasn’t Mitch Daniels. Of all the historical tidbits we sorted through to put together our hour-long radio special Progress Report, this one is particularly interesting to us: For how novel some of the changes to the state’s education policy can seem, Indiana enacted many of the same changes back in 1987. “We were truly leading the country in these kinds of reforms back then,” Derek Redelman, the resident education expert at the Indiana Chamber of Commerce, told StateImpact last May. Some of the changes seem pretty basic by today’s standards. The A+ Plan lengthened the school year to the current 180 days and created the ISTEP exams that Indiana students essentially take now, holding Indiana students to a single, unified set of academic standards — something taken as a given today. But even some of the policies we consider “sweeping changes” have precedent in the 1987 law. School ratings. Indiana’s current school rating system, which assigns A-F letter grades based on test scores, gets a lot of press as the mechanism behind state takeovers in “failing” schools. But the A+ Plan in 1987 did much the same thing, rating schools based on their ISTEP scores and “offer[ing] financial rewards to schools that improve the most, and impos[ing] financial penalties on schools” that lag behind. School accreditation was also linked to test scores, along with student attendance and graduation rates. Holding back students for poor test scores. Retaining students who don’t pass the controversial IREAD-3 exam today hearkens back to the original A+ Plan. The idea in 1987 was that students who didn’t pass the ISTEP had to come back for remediation over the summer. Those who couldn’t pass would be held back — much like students who cannot pass an IREAD-3 retake cannot take statewide tests as a fourth grader next year. Gov. 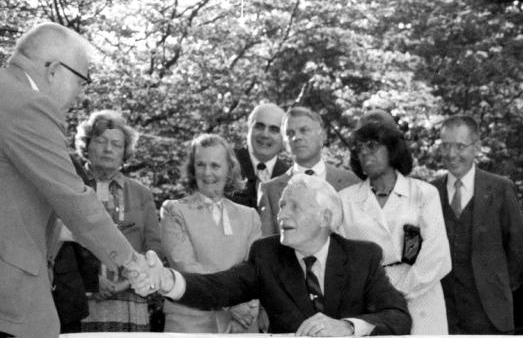 Robert Orr signs into law a sweeping education overhaul known as the "Indiana A+ Plan" on May 7, 1987. Teacher evaluations. Yep, we’ve been down this road before, too. The 1987 A+ plan called for “locally developed evaluations of teachers” to be tied into the school’s accreditation along with test scores, attendance, and graduation rates. The current statewide teacher evaluation mandate also leaves room for school districts to develop evaluations on the local level. All of the above are still hot-button issues. But at the time, some wanted Indiana’s overhaul to go even further. Orr originally wanted to extend the school year from 175 days to 185 — 180 was all he got. U.S. Secretary of Education Bill Bennett even accused the General Assembly and the state’s teachers unions of gutting the A+ plan by removing provisions that would allow for state takeovers at “bankrupt” schools… Takeovers… like… um, these? Eventually, much of Orr’s plan was gutted anyway. Orr’s plan raised taxes to front the package’s cost that one news account pegged at $550 million over two years (more than $1 billion in today’s dollars). But as the state ran into budget troubles in the early ’90s, money for the A+ Plan’s key programs — remediation, retention, financial incentives for performance — began to evaporate. It’s relatively-recent history, but Redelman says the days of “A+” can feel like a long time a go. Orr’s programs were created more than 20 years ago, and it remains unclear today just how his accountability measures improved education. However, few would argue with the premise that accountability is a key part of any evaluation system. Meanwhile, it will be some years before any beneficial results of Daniels’ creations — vouchers, more charter schools and merit pay — become clear. Daniels will have moved on, but he will have left behind a number of smart tools. It will be up to others to decide how they are used.